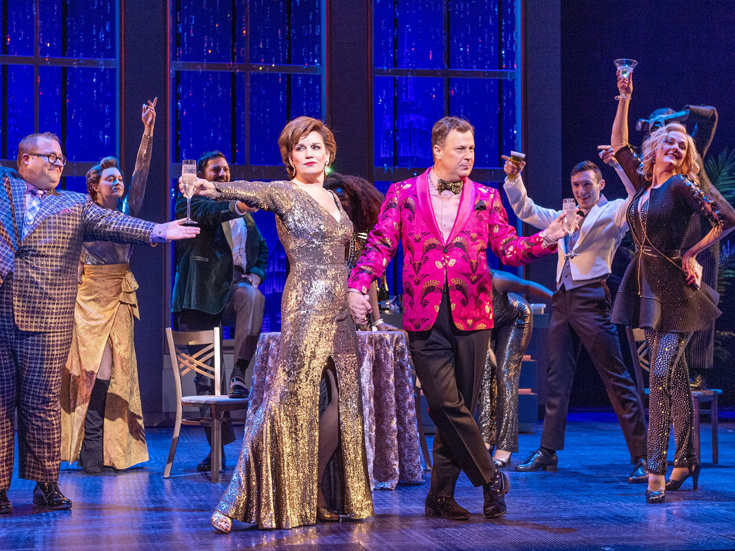 Beth Leavel & Brooks Ashmanskas will be considered for lead acting categories for their turns in "The Prom"
The Tony Awards administration committee met on January 24 for the second time this season to confirm the eligibility status of 10 Broadway productions for the American Theatre Wing's 2019 Tony Awards. The administration committee will meet a total of four times throughout the 2018-2019 season to decide the eligibility for the 73rd Annual Tony Awards. The productions discussed were The Lifespan of a Fact, The Ferryman, The Waverly Gallery, Torch Song, American Son, The New One, The Prom, The Cher Show, Network and To Kill a Mockingbird. Unless determined otherwise by the Tonys administration committee, actresses and actors billed above a show's title are automatically considered eligible in lead acting categories, while those billed below the title are eligible in featured categories. Notable among the rulings are Beth Leavel and Brooks Ashmanskas who will be considered eligible for lead acting categories, along with central star Caitlin Kinnunen, for their turns in The Prom. The Waverly Gallery stars Joan Allen, Michael Cera and David Cromer will be considered in featured categories, with Lucas Hedges, currently making his Broadway debut, eligible in the leading actor category with veteran star Elaine May considered a leading actress. Stephanie J. Block will also be considered a lead for her turn as one-third of the title diva star in The Cher Show, with co-stars Teal Wicks and Micaela Diamond deemed featured actresses. The full list of the administration committee's determinations can be found below. Paddy Considine and Laura Donnelly will be considered eligible in the Best Performance by an Actor/Actress in a Leading Role in a Play categories for their respective performances in The Ferryman. Joan Allen, Michael Cera and David Cromer will each be considered eligible in the Best Performance by an Actress/Actor in a Featured Role in a Play categories for their performances in The Waverly Gallery. Mercedes Ruehl will be considered eligible in the Best Performance by an Actress in a Featured Role in a Play category for her performance in Torch Song. Brooks Ashmanskas, Beth Leavel and Caitlin Kinnunen will each be considered eligible in the Best Performance by an Actor/Actress in a Leading Role in a Musical categories for their respective performances in The Prom. Larry Hochman and John Clancy will be considered jointly eligible in the Best Orchestrations category for their work on The Prom. Stephanie J. Block will be considered eligible in the Best Performance by an Actress in a Leading Role in a Musical category for her performance in The Cher Show. Christine Jones, Brett J. Banakis and Darrel Maloney will be considered jointly eligible in the Best Scenic Design of a Musical category for their work on The Cher Show. Jan Versweyveld and Tal Yarden will be considered jointly eligible in the Best Lighting Design of a Play category for their work on Network. The official cutoff date for Tony Awards eligibility is Thursday, April 25 for all Broadway productions opening in the 2018-2019 season. Productions meeting all other eligibility requirements and opening on or before the eligibility date are considered for 2019 Tony Award nominations. Nominations for the 2019 Tonys will be announced on Tuesday, April 30, with the Tonys ceremony taking place at Radio City Music Hall on Sunday, June 9. The Tony Awards will be broadcast live on CBS beginning at 8:00pm ET. The first round of 2018-2019 Tony rulings can be found here.